Dutch electronic music trio, Noisia, recently launched a new YouTube video series, ‘Behind Outer Edges’, that looks behind the scenes of their Outer Edges audiovisual show. Episode One is available now with a new episode released every fortnight (21/11, 5/12, 19/12). A rare and personal look into life on the road with Noisia (aka Nik, Martijn, and Thijs), each episode will focus on one member of the band, plus the extensive team who’ve helped bring the show to life, including the lighting engineer, production manager, visuals designer, the fashion designer behind the show outfits, and more. The series is an insight into the group and follows them as they tour across the world, from the launch of the audiovisual show in summer 2016, through to this summer’s festivals including Dour, Glastonbury, Roskilde, and beyond. ‘Behind Outer Edges: Episode 01’ focuses on Nik, looking at how he and the band sketched out the concept for Outer Edges and how this vision took shape (Nik oversaw all art direction, created detailed briefs for each track, chose the visual designers, and made a lot of the visuals himself). The film follows Nik from writing the music with the rest of Noisia, to him VJing on stage during the show, and the hardware he uses (including Resolume and Blade), giving a rare glimpse at the scale of planning, creativity and work that goes into producing one of their shows. After the launch at Czech Republic’s Let It Roll festival, Noisia headlined festivals including Sziget, Pukkelpop, Lowlands, and SW4, and tour highlights include apparently selling out their ‘Outer Edges’ shows in London (Electric Brixton) and Amsterdam (Melkweg) months in advance, and a headline show at Rampage, the biggest indoor bass music event in the world (capacity 15,000). 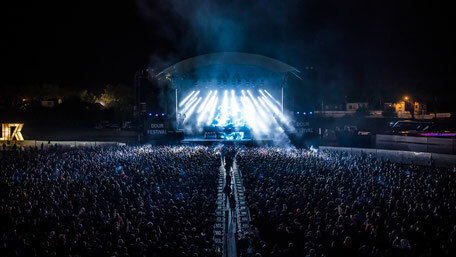 2017’s festival run included Glastonbury, Roskilde, Dour (where they closed the main stage in front of 30,000 people), Nass Festival, Exit, Dreambeach, and many more. Many of these performances and tour moments will be featured in forthcoming episodes of ‘Behind Outer Edges’. Check out the first show below.